The holiday season is in full swing. Before you know it, your kitchen will be pumping out glorious platters of food and your dining room will be bustling with friends and family from near and far. 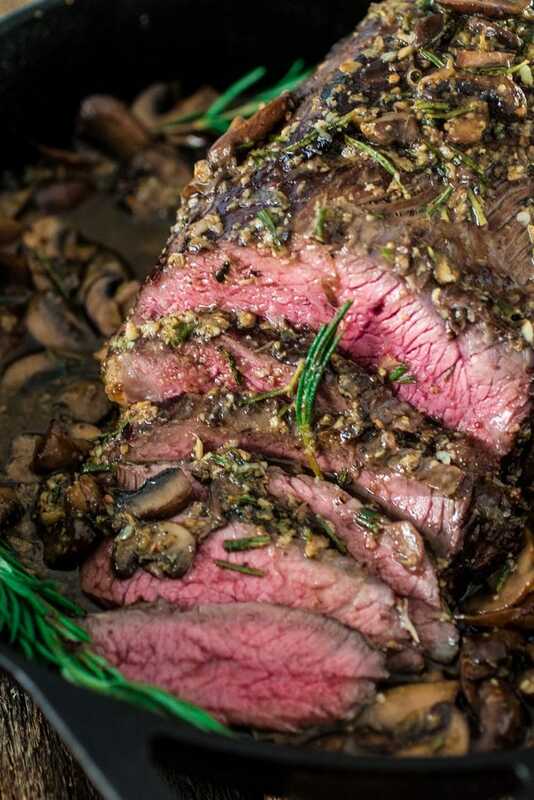 A great dish to serve at your holiday party is this Rosemary and Garlic Roast Beef. Tim and I had it for Thanksgiving since we had the turkey I made for the blog a few days before T-day and I know we’ll be having turkey for Christmas. So it was a great way to spice things up a bit. The roast did not disappoint! Juicy, garlicky, fragrant and incredibly mouthwatering. And the leftovers made the most amazing sandwiches. ? 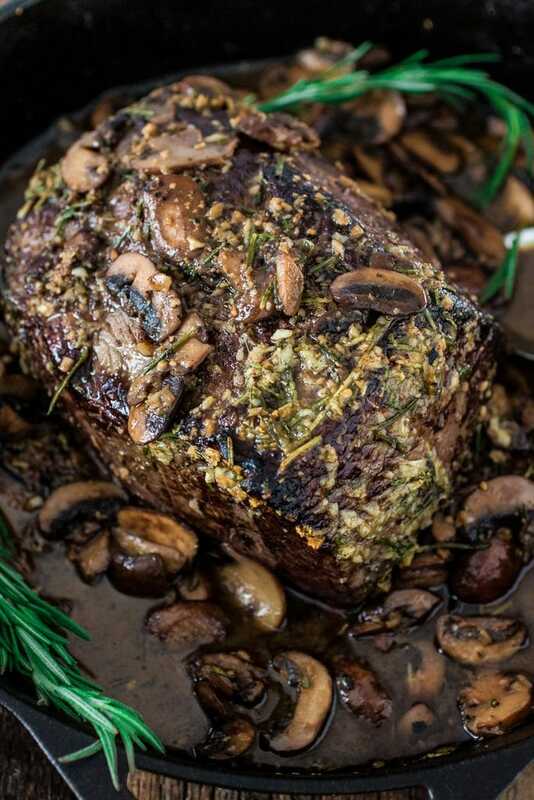 So yeah, a flavorful meat dish, crusted with garlic and rosemary and roasted to perfection, plus delicious sauce, plus buttery mushrooms swimming in that sauce equals the reason why your friends will keep asking you to host dinner parties over and over again. There is no doubt your Christmas party will be way more fabulous if you serve an elegant dish like this. But what about the drinks? Let’s not – never! – forget the drinks! I paired our roast with a lovely Rioja Reserva. It was delicious and I am not ashamed to admit the bottle was gone fairly quickly… Oops! We don’t usually drink that much, but when the wine is good there is no chance I’m letting it go to waste. Rioja’s Reserva and Gran Reserva wines are made from the best vintages and are aged in the bottles by the winemakers before release so you don’t have to. Aged at least three years, and usually longer, before release, these wines have refined character. A seductive glass of a Reserva Rioja wine is a perfect blend of soft fruits, leathery undertones, and subtle black pepper spice. Reservas offer notes of dark fruits like plums and dried cherries. 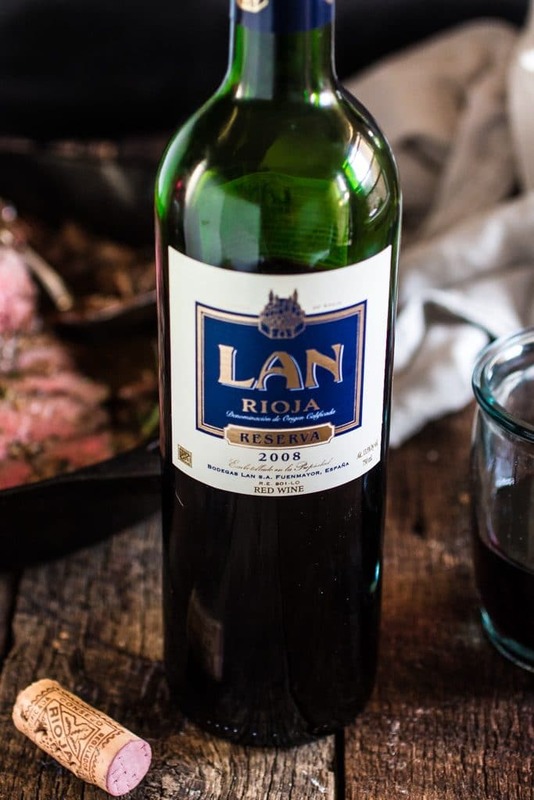 These wines are ideal with tender, slow roasted game meats and flavorful, hearty beef dishes. 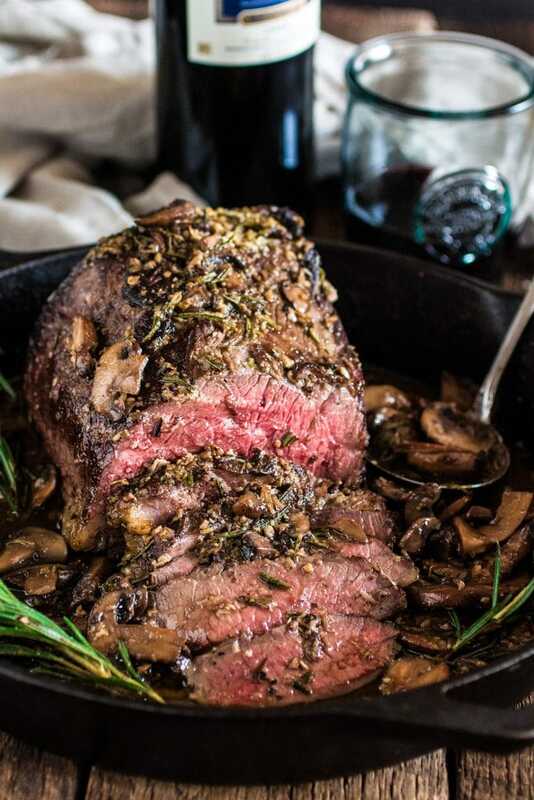 The fruits and cracked pepper hints of the wine are a perfect match with the herbal rosemary and garlic that becomes caramelized with this roast as it cooks. Its earthier tones are also a delicious fit with the mushroom and pan glaze that this holiday star is served with. I also gotta say that this dish is super easy and quick to make and requires minimum prep. Seriously, when was the last time you hosted a dinner party and still had time to do your make up and hair? I’m usually still in my sweatpants, with my hair looking like a bird’s nest, when the door bell start ringing. Ugh, so stressful! Then I have to rely on Tim to entertain people – not his best trait, I must say – while I hide in the bathroom, trying to look like a decent human being. With dishes like that, though? You will look like Gisele Bundchen while serving a dish that will leave your guests thinking you’re some sort of Martha Stewart! You might even have time to open a bottle of Rioja Reserva wines to enjoy while waiting for your friends. Tie the roast and season generously with salt and pepper. Mix together rosemary and garlic. Add 2 tablespoons of olive oil and stir to combine. Reserve. In a cast iron skillet, over medium heat, heat 2 tablespoons of olive oil and, once smoking hot, sear all sides of the meat. Remove skillet from heat. Brush the herb-garlic mixture all over the roast. While the roast is resting, sauté the mushrooms over medium heat with 2 tablespoons butter until cooked through and no liquid is left in the pan, about 5 minutes. Season with salt and pepper. Remove roast from the cast iron skillet and bring the skillet to the stovetop. Add stock to the pan and deglaze the pan, scraping all the bits from the bottom. Allow to simmer until thick. Add the mushrooms to the sauce, stir in the remaining 2 tablespoons of butter and stir until the sauce is silky. Then, place the roast back in the cast iron with the sauce and spoon some of the sauce over the roast. Garnish serving platter with fresh rosemary if desired. This looks so delicious! Totally bookmarked it to try before the end of the year! Yum! This recipe and THAT WINE look amazing! I love finding new wines to try, this is definitely going on my list! Probably about 2.5 to 3 hours. FOR SURE, use a quick read thermometer and follow the guidelines of internal temperatures for rare, medium rare, etc, as described in the original recipe above. Cooking beef is not a matter of time, but internal temperatures. Be sure to let the meat rest before slicing when it reaches desired temp and is removed from the oven. I’m going to make this tonight, it looks amazing and I can’t wait to try it! I thought that was odd too. Was planning to make this for Easter and need to time everything to make it to the table with everything else. Thanks for confirming. Mona, how was the roast once it was cooked? Yeah this recipe is at least an hour and half cook.time at 350 for a 3 pound roast. But once it was done it was really yummy. I did add a bit of tyme and a tiny bit of sage to the garlic rosemary mixture and it was awesome. What should I use if I don’t have a cast iron skillet? Olivia, Would you mind confirming your cooking time? I’m using this recipe for a pretty important event and want to make sure I cook it correctly. Thank you! The timing was perfect for my roast – actually, it was a little more than MR at 1 hour. Just one question, should I cover the roast? I made it and although it came out SUPER DELICIOUS!!! the gravy on the bottom of the cast iron skillet was a little dark and had a little of a burnt taste. I had to scoop out the garlic that was real dark. I was wondering if covering with foil would eliminate that. Thanks for your advice and for this insanely delicious recipe!!! Can this be done in a crock pot? Hi Katrina, I’ve never tried to make a rib eye roast in a crockpot, only pot roasts or other less expensive meat dishes that have liquid. However, I’ve heard that some people cook whole chickens in their slow cookers without adding any liquid and they swear by it. If you choose to try it, I would brown the roast first and I would make sure to make a layer of vegetables, like half onions, on the bottom, so the roast doesn’t sit in its own juices. I hope that helps! I made it in the crockpot today its delicious. I just followed the directions up to step 5, put celery and onion underneath, potatoes and carrots over the meat and added broth to cover. I let it cook for about 4 1/2 hours. So yummy! Did you cook it on low or high? This was my 1st time cooking a roast in a cast iron pan, and it turned out perfect ! I had a 2lb top sirloin roast, no mushrooms and a bag of little frozen onions plus lots of spices. After browning it , I cooked in the cast iron pan in the oven for 1 hour. Hubby made his own homemade gravy. The meat was tender and very flavorful! This recipe is a keeper !! Thanks !! My sister made this roast this past weekend for my mother & brother-in-laws birthday and I have to say O.M.G.!!! It was DELICIOUS!!! It was 3 lbs. and it fed 5 adults, 1 teenager and a 4 year old. Sister cooked per instructions. We served with roasted red potatoes, roasted asparagus and a blue cheese wedge salad as an appetizer. We had 2 small pieced of meat left, it was so delicious! Great recipe!! Will keep on file! Thank you so much :). I’m planning to serve 10 people. Any tips? I’m afraid of 1. size of roast. 2. timing and temp. 3. it won’t fit in my cast iron. Most delicious meal I’ve ever made! I believe this is prime rib and not a beef roast though. I found that an hour and a half in my oven was too long, but it was fantastic! I will cut down the cooking time next time. I like my roasts more medium that well done. Thanks for the awesome recipe! What kind of stock do you use ?? Beef ? Hi, Would this work with a standing rib roast? This was delicious. I used a 4.5 pound bone in rib roast but it worked wonderfully. The garlic on top burned a bit but it was still good. I’ll make this recipe again in the future. My 4.5 pound roast took only 1 hour and 40 minutes. Hi Kelli, I’m glad you enjoyed it! Maybe next time, if you notice the garlic is burning, tent the top with foil. :) I hope that helps! Wanted to make this for Christmas and was wondering whether it could be made using lamb instead of beef? Any thoughts would be greatly appreciated! I can’t see why not! :) I’m not really a lamb person, but I think the garlic/rosemary rub works for everything, even chicken. Just be aware that the cooking time might change. 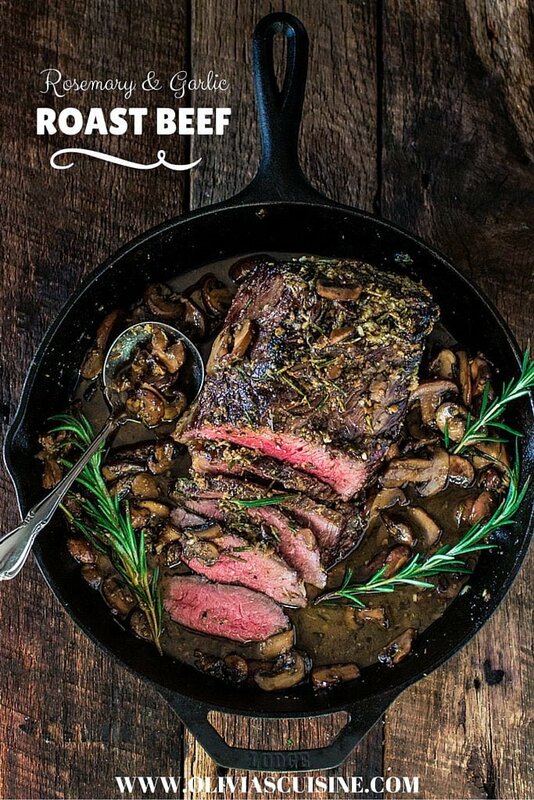 I am planning to make this with a bone-in rib eye roast for Christmas. Any tips or alterations recommended if using bone-in? Thank you! Hi Karen, the only difference will be cooking time which will probably be longer. Just use a meat thermometer to cook to the perfect temperature and you’re all set! Hey! I’m asking last minute but wondering if you cover the roast?! It looks like you don’t? Thanks! Made this for Christmas dinner and it was DELICIOUS. So flavorful. Everyone loved it. Thank you! I’m so glad everyone loved it! :) Thanks for taking the time to leave me some feedback. I really appreciate it! Can I use a different pan to sear on the stove and one to put in the oven? What are the cherries and plums used for? Garnish? Also, noticed some people saying this is a prime rib. Is that correct? Also, it looks like you used one type of mushroom. You mention a variety. What would you recommend? Made this for Christmas dinner and it was amazing! It will be my go to Christmas Dinner. I’m actually making it again tonight for our family dinner! My family loves this. We even managed a rare version with a shoulder roast. Always make extra mushrooms. The 14 yo boy was in tears when we surprised him with this for his birthday dinner. We are also using this for a friends wedding. 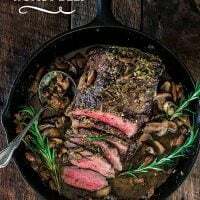 Can I use Beef Tenderloin roast or eye of the round at 3-5 lbs? Hi James. Yes, you can use any other cuts but cooking time will be different! :) Beef tenderloin for example, cooks much faster. Just make sure you invest on a meat thermometer and you will take all the guessing out of the equation! 5-star recipe! Although I had to make some small changes to it, it turned out to be so delicious! Thank you! This is simply amazing. It is my husband’s new favorite meal. I usually do bone-in because they have a monthly sale on it at my local grocery store and I loosely tent mine with aluminum foil every time or the garlic WILL burn. Any garlic that falls in the pan will scorch so I take any fallen garlic out before making the mushrooms to avoid the bitter, burnt garlic flavor. Any of the garlic mixture that stays on the roast is just fantastic and makes the house smell “like a holiday”. Five star recipe all the way! Do you have to tie the roast ? Can’t wait to try this recipe ! What sides would you recommend to serve at a dinner party with this dish? Hi, This looks delish! What did you serve with the roast? Sides? Bread? Desserts? Appetizers? I need help, because I am not great at pairing foods or wines. I love that you suggested the wine! The couple I am having over are foodies, and the husband can cook like crazy. I’d like to impress and add to all our evening’s fun with a delish meal. Thanks! Hi can this be made days ahead and frozen? I made this over the weekend for a Friendsgiving celebration. I followed the directions exactly and it came out perfectly! I would definitely make it again. We paired this with Mac & Cheese, Green Bean Casserole and a tossed salad. We also had bread for dipping into the mushroom sauce. I made this for my family Thanksgiving dinner. I followed your exact recipe right down to the iron skillet presentation. Definitely hit a home run with your recipe. I’ve received quite a lot of compliments. Thanks so much for sharing. I made this once before and it was delicious. I going to do it again for a family dinner for 10 of us. I bought a 5lbs rib-eye roast and had the butcher cut the bones off which i will use to make the stock. The questions I have are that your recipe calls for 350 degrees but the video calls for 400. Which is it? And also, does the weight change cook times? I would imagine that like a turkey or pork shoulder it is based on a per pound amount of time. Would 20-22 minutes per pound work? I made this recipe to test run it before Christmas and it was amazing!! My husband couldn’t stop raving about this roast. I have a large cast iron skillet. Do you think I could cook two three pound roasts in the same pan? What would the internal temperature be if I wanted to cook this to medium, not medium rare? 145. So I would remove from the oven at 140, as the temperature keeps rising while the roast rests! I made this last night for Christmas. Bought an 8 lbs rib eye roast for 12 people. Turned out perfectly!!! No left overs!! I cooked it for 3 hours on 350 degrees after searing. ( I asked for ribs out but there were ribs.) I will tent top next time to prevent garlic from burning. I coupled it with an orzo salad with lemon, feta, and pine nuts and a fresh green salad. Total winner!! Hi! Not sure if someone already asked this but what size cast iron skillet did you use to cook in? Thank you!! ACES!!! I made a few teeny modifications. Like way, way more butter and a touch of beef stock to the mushrooms whole being sauteed. I also There some carrots and onions in with the roast during its time in the oven. Absolutely lovely! Hint fellow stay at home husbands…. if your going to use DRY Rosemary, use only 2 tablespoons or take the time to follow the recipe and buy fresh Rosemary when you getting the other needed ingredients. Reading the recipe carefully may also help. Please don’t ask me how I know this (my sweet-hearted and understanding wife). Oh, we also need a new meat thermometer. I gave a 5 star rating as I cannot imagine this would have been anything but scrumptious if i had not been the chef. My husband doesn’t like mushrooms at all,wonder if it’s the same taste without it? Can you add potatoes and carrots to the pot in the oven during roasting? Oh my!!!! I made this tonight as a trial run for Thanksgiving 2018!!! Holy moly was it delicious!! Thank you for this awesome recipe!!! What if I’m serving 12 people? Would you suggest I make 2? Hi Hannah, you can make two or just get a bigger roast. But the cooking time will probably change! CAN YOU MAKE THIS DISH WITH SHALLOTS INSTEAD OF GARLIC? This roast was amazing! I used a 5 lb.. top sirloin roast browned in a cast iron skillet, and then transferred it to a roasting pan with a rack. I sauteed the mushrooms and made the gravy in the cast iron with the drippings. OMG it was good!! Will definitely make this again.